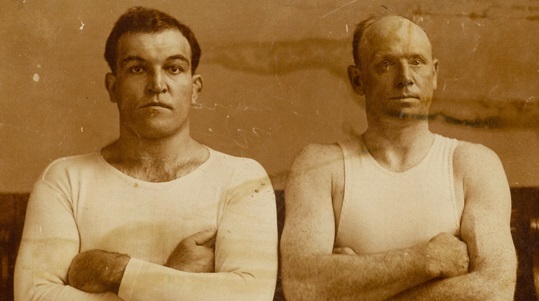 It is difficult to say how heavyweight champion James J. Jeffries would have matched up against more contemporary boxers, but there’s no doubt he was an extraordinary fighter. He lost only one match in his entire career and that bout, against the great Jack Johnson, happened long after his prime had passed. Unfortunately, it is the only one of Jeffries’ 24 professional matches to ever be filmed but it is clearly unfair to evaluate “The Boilermaker’s” prowess on a match which took place after almost six years of inactivity. 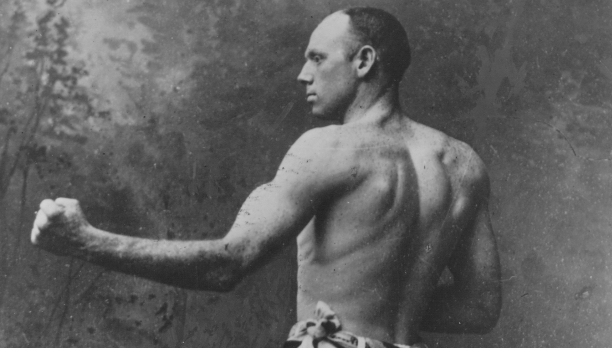 Jeffries had won the world title in 1899 from the great Bob Fitzsimmons at Coney Island, New York in just his 14th professional fight. 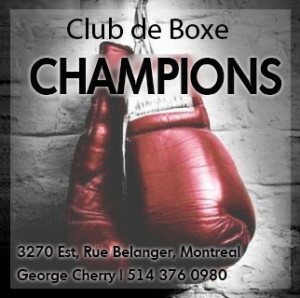 The bigger and heavier challenger had bulled his way inside the smaller champion’s guard and inflicted a vicious body attack, scoring four knockdowns and forcing a stoppage in eleven rounds. 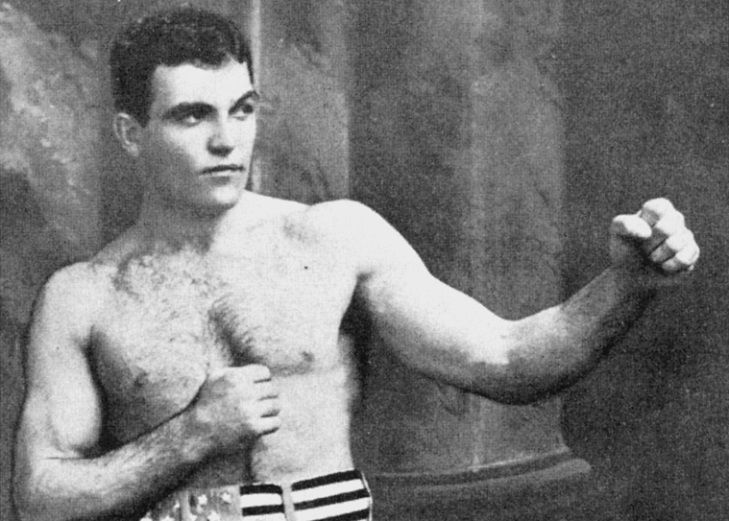 The rematch took place three years later after Fitzsimmons had put together a nice streak of wins capped by a dramatic second round knockout of the highly regarded Tom “Sailor” Sharkey, the same tough Sharkey who had lasted 25 rounds with Jeffries. That win appeared to set the stage for a rematch for the man called “The Freckled Wonder,” and fight fans eagerly awaited Jeffries vs Fitzsimmons II. But Jeffries made his rival wait a couple more years and by the time the return finally happened many wondered if the 39-year-old Cornishman’s advancing age might be too much to overcome. 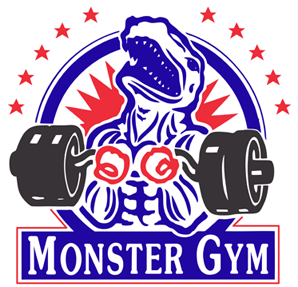 Besides, Jeffries figured to outweigh the challenger by 30 pounds or more. But those who backed the man who many today still regard as one of the greatest power punchers in the history of the sport, cited the former champion’s eagerness for revenge. Simply put, no fight had ever mattered more to “Ruby” and rumour had it he was so hell-bent on winning he planned to load his gloves with Plaster of Paris. “The Boilermaker” in his prime. No plaster was to be found inside the challenger’s gloves, but those watching in The Arena in San Francisco could be forgiven for thinking there was, as from the opening bell the smaller man inflicted a cruel beating on the champion. As early as the second round Jeffries was shedding blood as Fitzsimmons applied tremendous pressure, beating Jeffries to the punch over and over again. Rudy’s hard shots opened up deep cuts around both of Jeffries’ eyes and broke the champion’s nose. It was later revealed the challenger had in fact wrapped his hands with electrical tape instead of gauze, with no one from Jeffries’ camp objecting. Newspaper cartoon depicts the one-sided nature of the match. 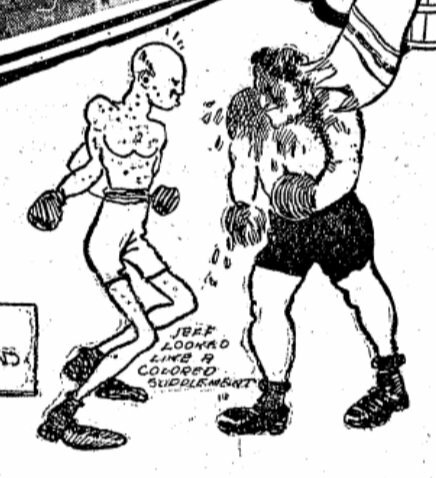 But Jeffries was nothing if not tough and durable and despite the carnage, he refused to concede. Instead he waited for his chance to strike back and it came in round eight. After a series of exchanges, Jeffries cornered his man. Fitzsimmons then inexplicably paused, lowered his guard, and spoke to Jeffries. The champion’s response was to move in and land a hard right to the belly followed by a thunderous left hook to the jaw that put Fitzsimmons down and out. Jeffries and Fitzsimmons: a pair of all-time greats. 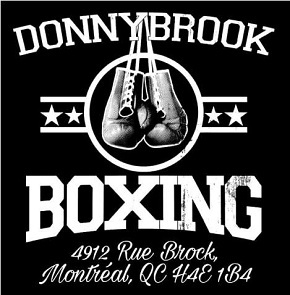 The bout’s conclusion struck some observers as suspicious and talk of a “fix” began to circulate in the days following, though both boxers dismissed the speculation. “The fight was won fairly and to the best man belongs the laurels,” stated Fitzsimmons. No one knows what the Cornishman paused to say to Jeffries just before the fatal punches found their mark. Was it a taunt which provoked a violent response from the champion? Or, as some later asserted, a kind of surrender? One version of the odd ending has it that after seven torrid rounds during which Fitzsimmons had repeatedly landed his best shots, the challenger was exhausted. 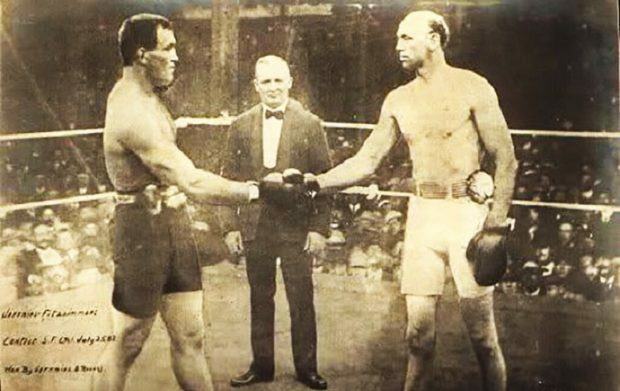 Instead of absorbing a beating as the match went on, Ruby, knowing he had nothing left, simply paused, dropped his hands, and told Jeffries, “Hit me.” “The Boilermaker” obliged and the fight was over.